8.5 x 11, SB, 110 pages, over 200 photographs and images. The modern battleship can trace its ancestry back to the ironclads with their steam drives, turreted guns and armored hulls. These beginnings are with the Union’s USS Monitor and the Confederate’s CSS Virginia (Merrimac) of the American Civil War. 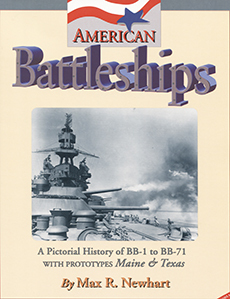 While there is an 8-volume set (the Dictionary of American Naval Fighting Ships), this book is condensed in history, construction and technical information and material. The book contains photographs and some diagrams, along with many details of each ship’s original commission and any upgrades and refits.